Deadline reports that a sequel to Tim Burton’s 1988 horror-comedy Beetlejuice may be in the works, in keeping with the recent dictum illustrated by Flatliners and Frankenstein that all prospective “resurrected” film properties make for easy puns, as we all live inside a blog now. As some may recall, another Beetlejuice has been rumored since around the time of the first film’s release, with Burton even hiring Mars Attacks! writer Jonathan Gems at one point to craft a script called Beetlejuice Goes Hawaiian, which concerned the Deetz family experiencing yet more ghost troubles at a tropical resort and, apparently, Beetlejuice becoming “a hero by winning a surf contest with magic.” Despite most Beetlejuice fans saying they wished the first film had involved more magical surfing, the sequel never got made despite receiving several rewrites (including one that was offered to Kevin Smith, who turned it down) and intermittent support from David Geffen, who does not give of his love freely. Now it looks as though monster mash-up author Seth Grahame-Smith (Pride And Prejudice And Zombies, Abraham Lincoln: Vampire Hunter) could be the latest to take a crack at it, thereby expanding on the relationship he recently formed with Burton while doing script work on Dark Shadows. 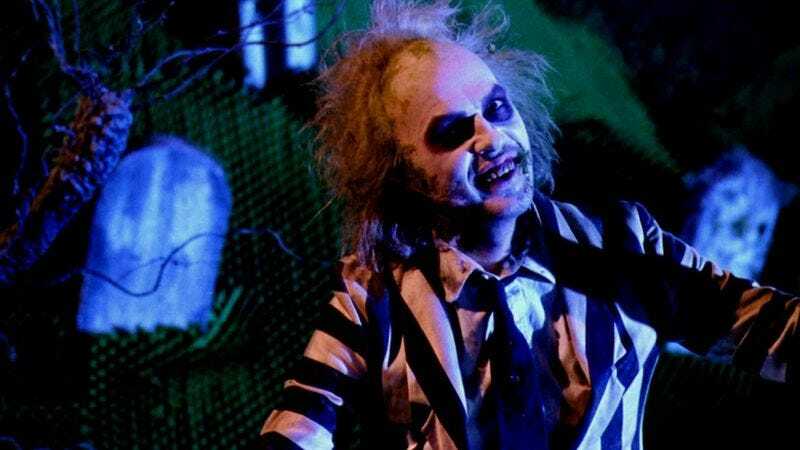 According to Deadline, Grahame-Smith will make Beetlejuice 2 one of the priority projects at KatzSmith—his recently formed production company with his Hard Times Of RJ Berger partner (and Jeffrey Katzenberg kid) David Katzenberg—with plans to “reboot it by advancing the storyline of the original,” rather than remaking it. You’ll notice a lack of surfing contests in that story, so presumably it will take a different direction than Gems’ script. And for what it’s worth, both Michael Keaton and Geena Davis have expressed enthusiasm for doing a Beetlejuice sequel whenever it's brought up by reporters who have run out of things to say about their current projects. So, congratulations to those guys: By saying “Beetlejuice 2” aloud the correct number of times, you’ve now willed that into reality.